The first term is multihoming. This is a BGP configuration where multiple connections to the internet exist. This allows for load balancing as well as redundancy – you don’t want to have internet connectivity cut off if one path goes down. Single points of failure are never good, but can be positively crippling with BGP. Send default routes and selected more-specific routes into the AS. If the ISP sends only default routes into the AS, the non-BGP speakers in the AS will naturally use the path with the best metric to reach external destinations. With the other two choices, BGP will generally use the AS_PATH value to decide how routers in the AS should reach external destinations. The ISP has to walk a line between having more-specific routing tables and overtaxing router resources. If memory and CPU are a concern, you should consider receiving only a default route from the ISPs. Receiving only default routes causes the least stress on your router resources. You can opt for a combination of default and more-specific routes, but in the real world, you’ve usually got a router that can handle the load of specific routes or a router that can only handle default routes. *The network command is generally your best bet. Just as there are private IP addresses, there are private AS numbers. The AS numbers 64512 – 65535 are considered “private” AS numbers and just as private IP addresses should not be advertised to external networks, neither should private AS numbers. Public or private, you can’t assign AS number zero with BGP, just as you couldn’t with EIGRP. Prefix Lists are used to fine tune BGP and decide what routes are to be advertised or NOT advertised. They are also extremely fast, efficient and easier to use than ACLs, although they follow almost the same logic. They also use sequence numbers, so making changes to certain lines is nice and easy. We know that by default R2 and R3 will not receive the loopback on R4, this is because of BGPs Split Horizon rule… yadda yadda… We need a full mesh or our good friend next hop self. We can get round this simply by using the next hop self command on R4.. yadda yadda been here before several times! Starting to sink in! …and we want to use a prefix list to stop both R2 and R3 from receiving these routes, but to still receive the route to 10.10.10.2/24? First, if a route is expressly permitted, it’s used; if it’s denied, it’s not used. Explicit Deny doesnt override the Implicit Deny – MAKE NOTE! 1. Use dynamic or static routing to get a route to the eBGP router in the relevant iBGP routers IP routing table, or configure next-hop-self on the router performing the eBGP peer. The result is a next-hop address that the iBGP router can reach, so the BGP route is now valid and best. They reduce the number of TCP connections needed in an iBGP deployment. Just as importantly, route reflectors allow us to get around the rule of BGP Split Horizon – because unlike other protocols you studied in the CCNA, you can’t turn BGP Split Horizon off at the interface level. To verify that a router is seen as a route reflector client, run show ip bgp neighbor x.x.x.x. This is an excellent command for overall BGP troubleshooting. BGP Clusters are a combination of route reflectors and clients that are sharing information. There can be more than one route reflector in a cluster. When deciding on the routers that will be the route reflectors in a cluster, you should consider both the peering relationships in place (and the ones that would need to be added to make the route reflector work) and the impact on router resources that being an RR creates. Make sure the routers that will serve as the route reflectors in your network possess the resources to get the job done. If BGP Split Horizon is intended to stop routing loops, why is Split Horizon not an issue with clusters? Because the Originator-ID identifies the router that originated the path. This attribute is set by the route reflector and effectively eliminates the chance of a routing loop. If the router that originated the route receives the route in an update, the update will be discarded. Where Do Route Reflectors Send Routes? Updates from RR clients are sent to all client and non-client peers. Updates from eBGP peers are sent to all client and non-client peers. Updates from nonclient peers are sent to all clients in the cluster. BGP route reflectors are the exception to the BGP Split Horizon rule. 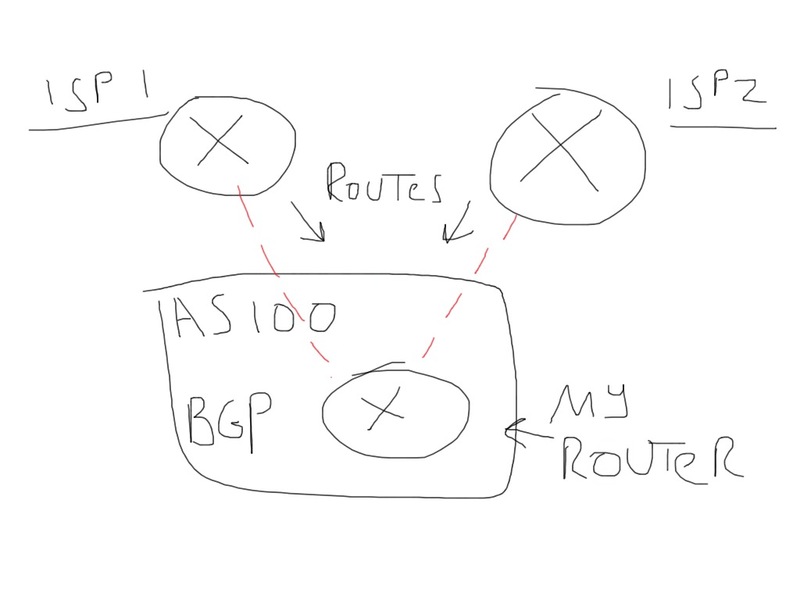 A router configured as a BGP route reflector can take a route learned from one iBGP peer and advertise it to another iBGP peer. The iBGP peers that will be sending routes to the route reflector are referred to as clients. When one client sends a route to the route reflector, the RR does just that – it reflects the route to the other clients. To the clients, this is a totally transparent process. The clients don’t even know they are clients, and they require no additional configuration. All clients must peer with the RR. Clients will not have a peer relationship with other clients. This allows us to have BGP work with a partial mesh rather than a full mesh. Rather than implementing and configuring a full mesh, we can use a hub and spoke topology with our hub acting as the RR and the spokes as clients. This will be a massive reduction in overall BGP TCP connections. A BGP speaker that has a peer relationship to an RR does not have to be a client; these speakers are called nonclients. Non-clients do have to have a TCP connection to every other router in the AS. This is extremely rare, however worth mentioning. 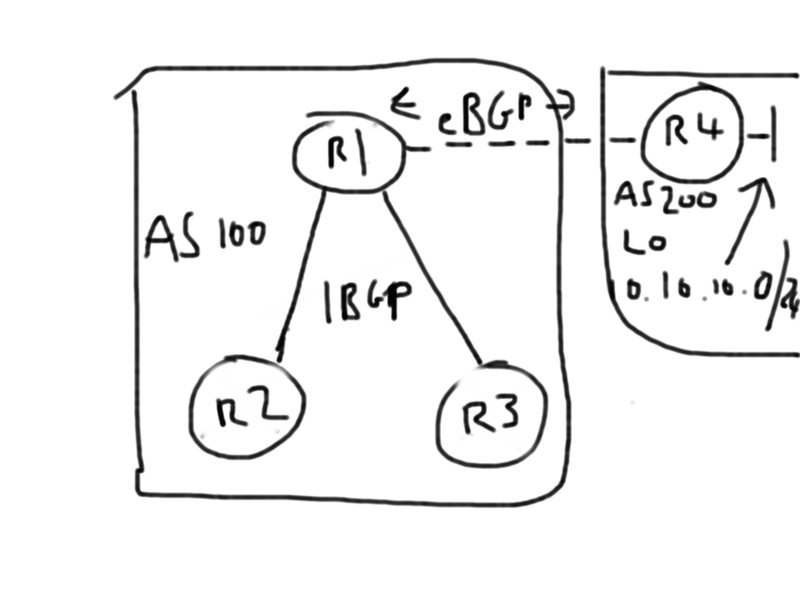 If we have an iBGP setup between routers R1 and R2 (AS100) and an eBGP peer between R1 and R3 (AS200) WHEN ALL CONNECTED ON THE SAME SUBNET!!! A BGP speaker is allowed to advertise the IP address of an internal peer as the next-hop address IF the external peer receiving the route has a subnet in common with the internal peer. So if R1 is the hub and R2 and R3 the spokes, R1 will have a next hop ip address of R3 to reach R3s loopback interface, not a next hop of R2. This is because R1 and R3 share the same subnet. I presume this is rare as most eBGP peers like this are not done on a shared broadcast segment. This built-in feature is designed to bring about the most accurate routing possible which is correct in this rare scenario.